Say hello to the aera series: Easy-to-use pilot/motorist GPS solutions from the leader in both Aviation and Automotive portable navigation. Featuring crisp 4.3-inch QVGA wide-format displays with touchscreen interface. Free UPS shipping by 2nd-Day Air anywhere in the USA. One year of prepaid database updates. 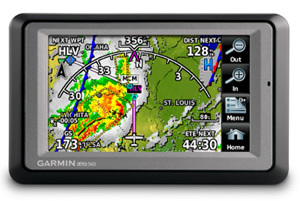 The most feature-rich navigator in Garmin's aera lineup, the 560 model combines a more advanced list of automotive and piloting capabilities with higher-resolution 9 arc-second terrain/obstacle graphics that yield over 11 times more onscreen resolution than the standard 30 arc-second versions. As in all the aera models, GPS updating is provided at a super-fast 5 per second rate. And you also get full support for the latest in XM WXTM satellite weather capabilities(1). With coverage for the U.S. and Canada, the XM service lets you reference detailed NEXRAD imaging and METARs data, as well as current reports on precipitation, lightning, winds aloft, airport terminal forecasts, and more. Weather graphics can be overlaid on your aera's moving-map display. And for added entertainment value, your XM receiver can also be used to access over 170 channels of digital audio entertainment (XM subscription required). The GXM 40 smart antenna is included with your aera 560. And a single integrated cabling solution for power, music and datalink weather options makes for easy, clutter-free aera connectivity in your cockpit. In addition to the XM satellite access, your Garmin aera 560 comes fully preloaded with detailed flight mapping, terrain/obstacles alerting, U.S. SafeTaxi® charts, and AOPA Airport Directory data. So, you'll have a wealth of information resources at your fingertips to help you make better flying decisions. A full year of prepaid aviation database updates is included with your aera 560 purchase. 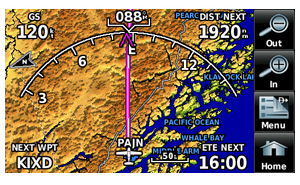 And to further enhance situational awareness, the aera 560's graphical Terrain page offers both overhead and vertical profile views of the topography under your flight path. There's also an IFR map mode that lets you display and navigate on high or low enroute airways - while using your touchscreen map cursor to reference MEAs (Minimum Enroute Altitudes) and distances between intersections. Plus, to help with traffic surveillance, an optional power/data cable (sold separately) makes it easy to interface your aera with the Garmin GTX 330 Mode S transponder in your aircraft, thus enabling you to access and display TIS traffic alerts in busy terminal airspace. As an added convenience, you can also use the aera to load communication frequencies into your Garmin SL 40 Comm or SL 30 Nav/Comm transceiver. The segue from pilot to motorist is seamless when you go with the aera 560: Its 'dual boot' design, supported by preloaded City Navigator® NT street mapping, converts to 'road mode' in a virtual heartbeat. 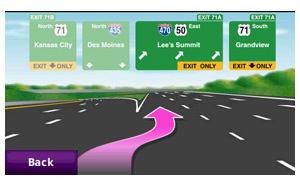 Operating much like Garmin's popular nüvi® line of touchscreen auto navigators, the aera 560 offers voice-guided turn-by-turn directions with text-to-speech audio technology that calls out streets by name. In addition, there's built-in Bluetooth® support for wireless hands-free calling with your compatible mobile phone. Other premium features available on the aera 560 include lane assist with junction view, speed limit notification, Navteq traffic alerts, and more(2). Plus, you can still enjoy XM Radio and monitor XM WX satellite weather while operating in auto mode. And to speed your transition from aircraft to automotive mode, there's also a unique 'smart mount' for the aera that helps get you on your way with instant clip-and-go navigation. 1. Subscriptions are required for optional XM weather and audio entertainment packages (sold separately). 2. Navteq traffic alerts require the GTM 20 (sold separately). Traffic content not available for all areas. 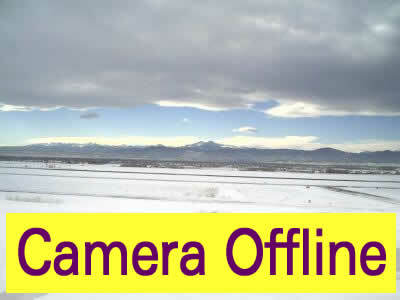 See www.navteq.com/rdstraffic for traffic coverage areas. Call us for a free, customized consultation on aviation GPS. We know and use these products ourselves, and we can help you select the right one for your needs. Call 970.203.0505 or you may send us a message using the form below. Garmin aera 560 GPS email inquiry form.